Who doesn't like to have soups? Soups are generally defined as liquid food especially of meat or fish or vegetable stock often containing pieces of solid food. You all love soups, don't you? We know your tastes. That's why here we have brought for you some splendid soup recipes. Try these out. If you like them, click here to refer this page to send these recipes to anybody you want. Thinly slice the chicken breast meat. Bring the chicken stock to a rolling boil and add the chicken and mushrooms. When the soup starts to boil again and all of the ingredients float to the top, remove from the heat. Add the sesame oil and sherry and taste for seasoning. Add salt and pepper if necessary. Serve in individual soup bowls and sprinkle the parsley on top. Chop the celery tops and cook them in the water with the salt for about 10 minutes. Strain, reserving the water but discarding the celery tops. Mince the celery stalks finely. Saut this with the onion in the margarine for two minutes. Stir in the flour. When well blended, add the peanut butter and mix well. Stir in the soya milk and celery water. Stir over a low heat until the mixture boils. Simmer for two to three minutes. Season to taste with black pepper. Sprinkle with paprika to serve. Put cellophane noodles in large bowl. Cover with boiling water. Let stand 5 minutes. Drain thoroughly. Heat oil in wok or deep large skillet over medium high heat. Add onion and carrots and stir fry 3 minutes. Add garlic and ginger stir fry 30 seconds. Add stock, water and soy sauce. Cover and boil 2 minutes. Add ham water cress, mushrooms and noodles. Return to boil. Cover, turn off heat and let steep 2 minutes. Add snow peas, cover and let steep until vegetables are crisp tender about 3 minutes. Stir in sesame oil, rice vinegar and red pepper flakes. Adjust seasoning. Serve in deep bowls, sprinkle with green onions. Heat oil in a large Dutch oven over medium-high heat. Add chopped onion, celery, minced ginger, dried thyme, and saffron threads, and saute 5 minutes. Add sweet potato and orange rind, and saute 3 minutes. Add broth and red pepper, and bring to a boil. Cover, reduce heat, and simmer 25 minutes or until potato is tender. Place half of potato mixture in a blender or food processor, and process until smooth. Pour pureed mixture into a bowl. Repeat procedure with remaining potato mixture. Return pureed mixture to pan. Stir in the spinach, and cook until thoroughly heated. GARNISH: minced fresh parsley, dash of paprika, minced fresh chives, grated cheese, sliced almonds, or finely diced sweet red peppers, opt. In Dutch oven or 4-5 qt saucepan, place potatoes, celery, carrots, onion, garlic, stock, and seasonings. Bring to a boil, cover, lower heat, and simmer until vegetables are very tender, about 10 minutes. 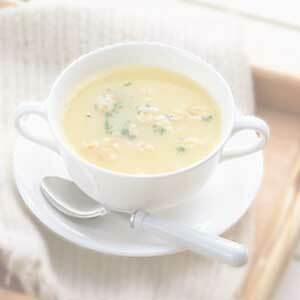 (The potatoes must be fully cooked to thicken the soup properly.) While the soup is simmering, steam the broccoli florets. When the simmered vegetables are tender, transfer it and broth to food processor, and process till smooth. Return pureed soup mixture to pan. Stir in broccoli florets. In a measuring cup, combine remaining ingredients. Add to soup and heat; do not allow mixture to boil. Top each serving with garnish if desired. pot and heat through. May be served with a dollop of sour cream on top.